Thank you for re-posting your link if I deleted it! Apologies for my goof up! Apologies... I've put my sign-up link in the wrong place. Could you delete it? Thanks. Thanks Gilion, I enjoyed this challenge. I enjoy this challenge. I signed up for 2017 too. I did better than I expected! I was aiming for just one lonely one, and I ended up reading four! Thanks for hosting, and I'm signed up again for 2017. Cath: Yes, I will figure out how to delete your post. Carol, Susan & Darlene -- Congratulations on finishing! Glad you enjoyed it! I completed 11 books that qualified during the 2016 calendar year. I reviewed most of them in the last week or so. 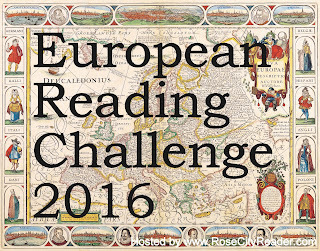 I don't have anything else for the 2016 European Reading Challenge.